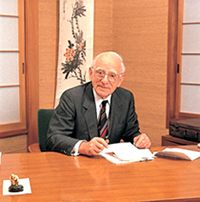 On April 1st, 1948, Mr. Claus Correns founded his company C. Correns & Co. in Tokyo. After the end of World War II, German citizens were repatriated, stopping all German related business activities in Japan. C. Correns & Co. was the first German company allowed to re-start business, supporting the reconstruction of Japan after the war. Still today, the entrepreneurial spirit of those days is part of our company culture. 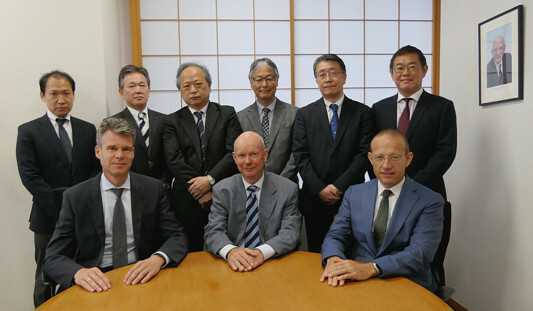 Our German-Japanese management team ensures that the business customs and requirements of both our European principals and our Japanese customers are equally taken into consideration and respected. The German shareholders of the company are actively working in the management of the company, guaranteeing fast decision-making and a smooth communication with the European suppliers. Correns dedicated Japanese sales engineers have an in-depth knowledge of their field, seeing our principals through the various steps of sales in Japan. Starting from initial market research to performing customer visits, organizing trade shows and exhibitions, create Japanese language home pages for our suppliers and organizing reference visits trough to factory acceptance tests, site installations, after sales visits, spare parts supply and sometimes as well trouble shooting, Correns takes care of your business in Japan. To sell machines without offering local technical service is not possible in Japan. To cover this requirement, Correns employs more than 20 technical service engineers. They are based in the key locations Hiroshima, Nagoya, Osaka and Tokyo for quick customer access. Correns service engineers are also involved in factory acceptance tests, machine installations, service and maintenance of machines. In addition to this Correns also provides the following services in-house: Bridging of differencing payment terms and legal expectations, required certificates for Japan as well as logistic of goods, including shipment by sea or air, transportation insurance, import permits and customs clearance, local transportation in Japan and many more. If you are a technology leader in your industry and interested in a market extension to Japan, please do not hesitate to contact us! We are happy to assist!